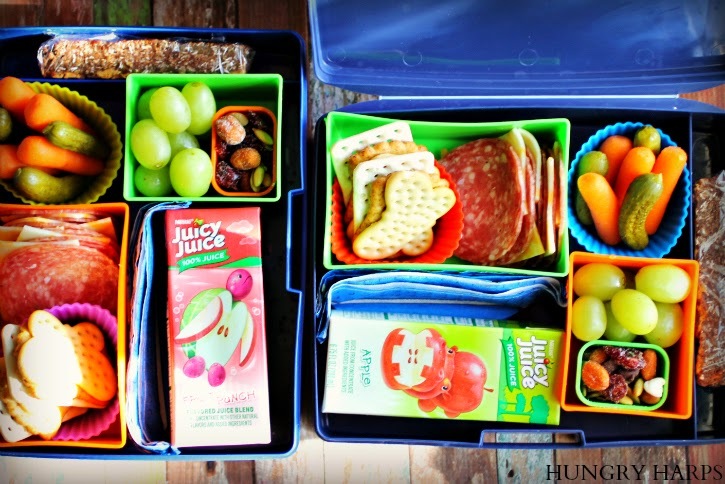 I can't believe that the time is here for me to start packing school lunches for my kiddos! Although we do homeschool and I don't necessarily need to pack them a lunch, it is something that they like me to do for them - so I do it. (I'm a sucker...) They absolutely love the thrill of opening up their lunch boxes and being surprised with what was packed for the day - and I love being able to watch the delight in their eyes when they do so. 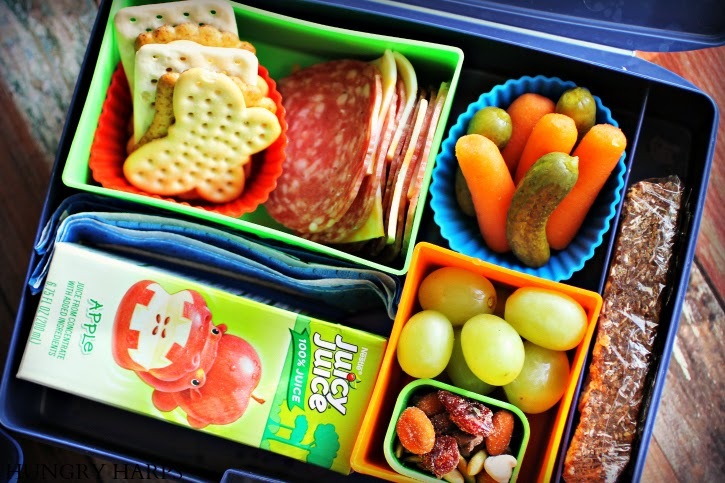 I don't get fancy with their lunches and I don't have a drawer-full of gadgets to make their lunches appear like something off of Pinterest. I am SO not that mom. (No offense, I just don't have time for it.) I am all about keeping it simple but still making it awesome. My oldest (at 5 years old) son's #1 question to me when he eats food I've given him is, "Did you make this, Mom?" If I say no, he shrugs and says "HM" (disapproval much?? ha!) if I say yes he gets a huge smile and tells me I am such a good cook. (That's #MyGoodLife!!) 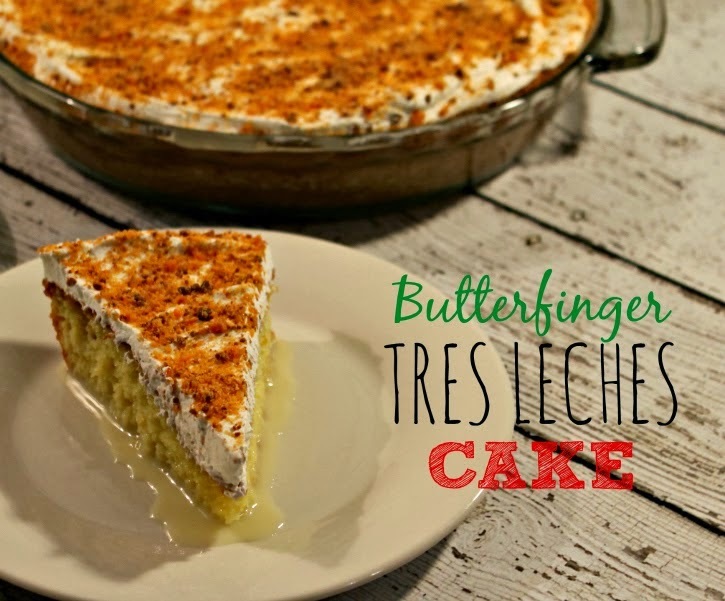 Now if that isn't incentive for me to want to make EVERYTHING homemade, I don't know what would be! I think it really does make a difference to him, so I like to include something homemade in his lunches - one of our favorites (yeah, mine too...) is homemade granola bars. 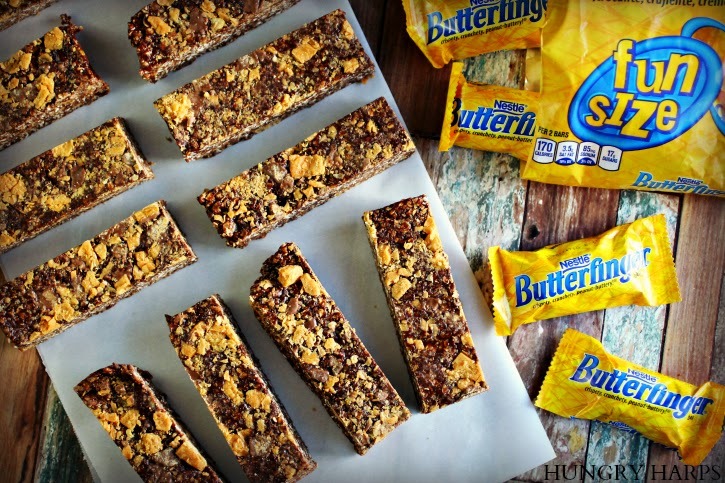 I recently made a batch of Butterfinger Granola Bars that turned out fabulous and did not disappoint in the lunch box department one bit! 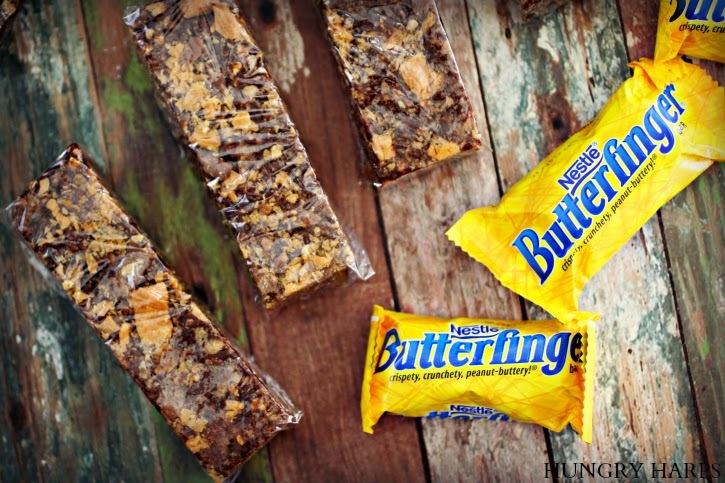 Not only are these Butterfinger Granola Bars a Butterfinger-Lover's (Bart Simpson totally pops into mind!) dream, they are seriously a cinch to make. 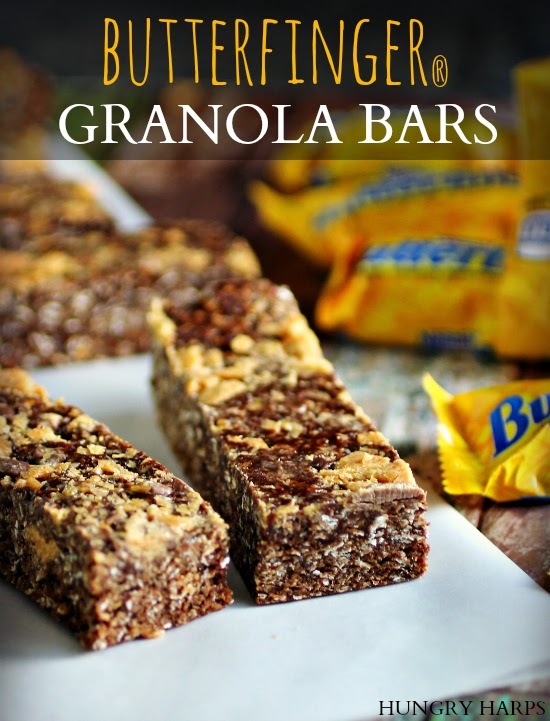 Oh, and just take a moment to think how cool your kids will think you are for making a Candy Bar Flavored Granola Bar. Coolest Mom on the block, handsdown. 1. 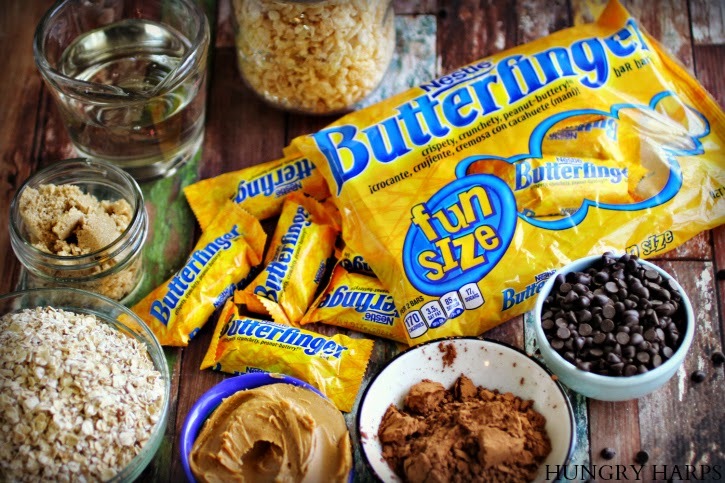 Add corn syrup, peanut butter and brown sugar to larger microwave-safe bowl. On high, microwave for 1 min and 30 seconds. Stir to combine. 2. Add cocoa powder, vanilla extract and quick-cook oats to corn syrup mixture and mix well. 3. Add rice cereal in two batches, pop back in the microwave for 30 seconds if needed. 4. 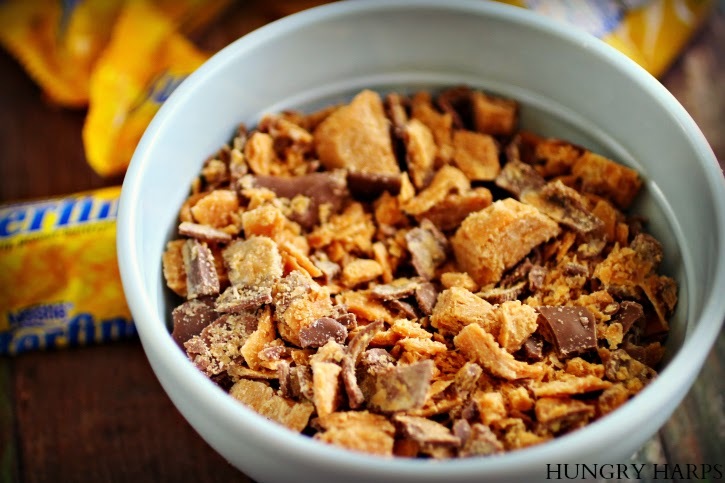 Stir in mini chocolate chips and ¼ cup Butterfinger pieces. 5. In 9x9 parchment-lined square pan, press down granola bar mixture. I put another piece of parchment paper on top of granola mixture then use my fingers to get mixture somewhat evenly spread, then I use a spatula to really flatten it out. 6. 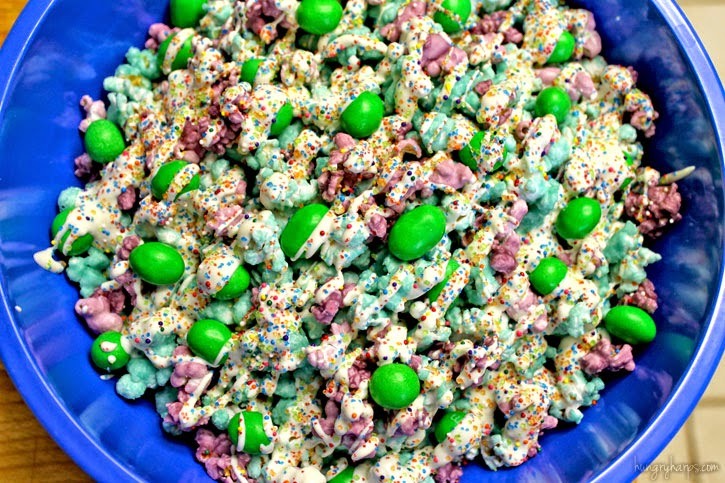 Sprinkle top with remaining Butterfinger pieces. Press down into mixture using same technique as in step 5. 7. Let bars set in fridge for at least 3 hours, I usually let mine sit overnight. 8. Cut and serve! I wrap any unused bars in plastic wrap and store in the refrigerator in a resealable plastic container. Either freeze or enjoy within 7 days! To make these granola bars lunch box friendly I just wrap them individually in plastic wrap. Then we store these in the fridge in a sealable plastic container. I've never had any last more than 4-5 days (due to the animal-like eating behavior at my house), but I imagine you wouldn't want to keep them for longer than a week due to the chocolate starting to break down. 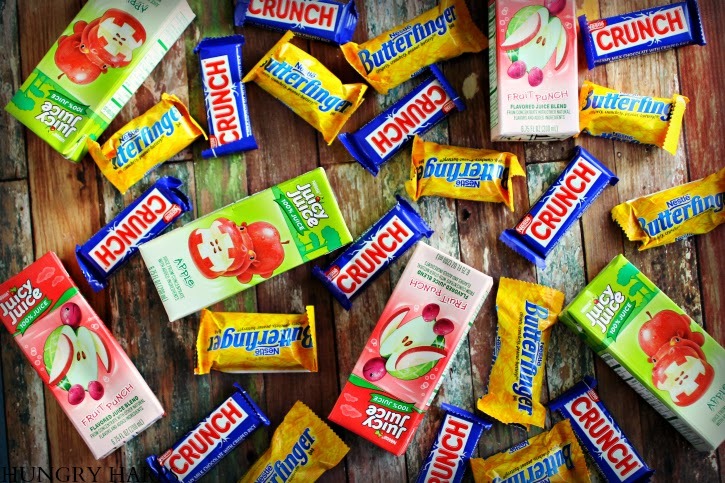 Freeze any bars that you don't plan on consuming in 4-5 days just to be safe! As you may already I know, I practically live at Walmart... So, that's where I ended up purchasing ALL of these lunch products. 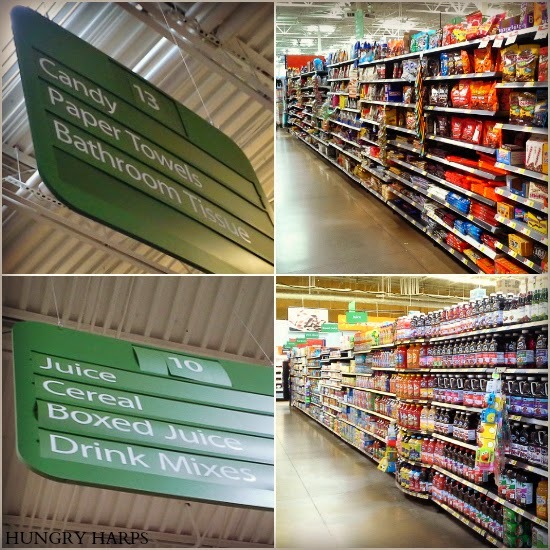 With Halloween around the corner, you may need to check seasonal aisles for the candy bars!